As with all new technologies, there's a bit of a learning curve to understand the gotchas. Over the past few months, I've started replacing incandescent bulbs with low-energy light-bulbs, more formally known as compact fluorescent bulbs. When I first started making the switch, my biggest concern was the color and brightness of the light emitted from these bulbs. I did not like many of the ones I've seen in hotel rooms which were too dim and yellow. A visit to Home Depot solved that problem since they had some on display that you could juxtapose which worked out very nicely. Once I understood the color terminology such as bright white, soft white, etc, I thought I had the problem licked. Unfortunately, there's a problem that I can't figure out how to solve which is that some compact florescent bulbs take longer than others to reach full brightness (on the order of a couple minutes). Here's an example where I installed four GE bulbs of the same power and color with very different results. Although the following photo does not show the true difference, I can tell you that the bulb on the right is much, much brighter than the others for the first two minutes. The three on the left are so dim, when first turned on, that they're truly annoying. But, once they're are warmed up, you can't tell the difference. 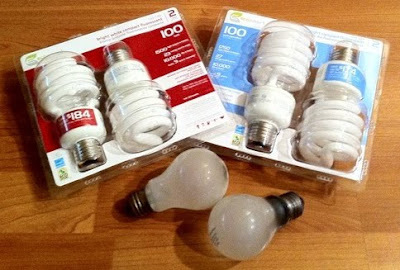 In my limited experience with these bulbs, the only thing I've noticed, in common, about the bulbs with the long warm up time is that they're all made by GE. Of course, the irony is that GE is suppose to "bring good things to light." If I could go back, and do it again, I'd look for white LED bulbs instead of compact florescent lights to replace my incandescent bulbs.